Jessica has taken on the role in our family of finding new bands to fall in love with. She found The Shout Out Louds a couple years ago and they’ve become a staple in our home. This year she found a bunch of bands and two that stand out are Bishop Allen and Vampire Weekend. Vampire’s new record is amazing, but since it doesn’t come out until January, it won’t be on this year’s top 10 list. 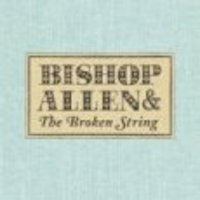 Bishop Allen’s The Broken String is a fantastic record. It might have been in my top 10 except for the fact that we just started listening this month and I just don’t know how it will stand the test of time. I heard The Decemberists, Ben Kweller, and The Magnetic Fields in their music. It’s smart pop and it’s easy on the ears. This is the kind of record that you listen to a few times and then all of sudden you find yourself singing along. The catchiest song on the record is Click, Click, Click which I blogged at fredwilson.vc. Give it a visit if you want to hear that song. For those looking for a taste right here, here’s a song called Rain. Thanks to The Leather Canary for hosting that mp3 for Rain. It’s one of dc’s top songs of the year.